Today I have been able to tick off one of the countries I expected to be the hardest to obtain in this challenge, Moldova. A huge thank you is owed to Vasile, who has provided both the mug and the beer for this evening. Moldova is a former Soviet country which gained independence in 1991. It is a country of about 3.5 million people and Bere Chisinau is the main beer that Moldovans drink. Apparently it sells quite well in neighbouring Hungary, however this may very well be the first can ever to enter Australia! I imagine this will be the only time in my life that I will sample this beer, let's crack this can open. Once the can is poured the first thing that I notice it the big, thick white head that gushes forth. It's made up of very dense small bubbles and has excellent retention for an Eastern European lager. The beer itself is a light golden/yellow colour with plenty of carbonation. It's a really good looking lager! Hopefully it tastes as good as it looks. 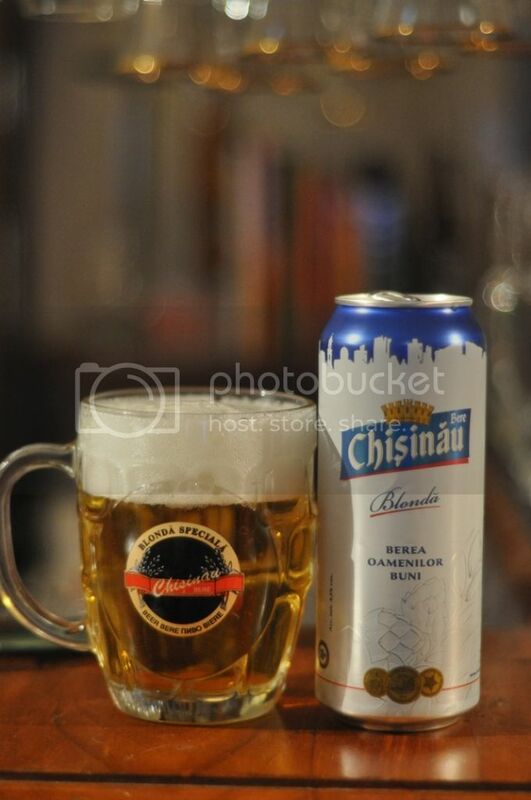 Bere Chisinau smells slightly different to what Westerners would consider an average lager. It has a very malty aroma with only hints of hop bitterness as the beer warms up. This all sounds normal but there is also an odd honey aroma which I can only assume comes from the malts. It may smell a tad sweet for some but it's not offensive in anyway which is always a good thing. Moldova's national beer is an easy drinking lager. It has a really interesting malt body with clear notes of the honey that were present on the nose more pronounced than expected. The beer is actually quite bitter and has some really hop character, which is a pleasant surprise considering the lack of nose to this effect. The finish is crisp and dry, everything you want in a lager. All-in-all Bere Chisinau Blonda is a reasonable lager and is much better than my expectations were for a Moldovan beer. This beer would be a really good nice beer on a hot summers day. Chisinau Blonda is certainly not a lager that I would go out of my way to get, but you could definitely do alot worse than to drink this beer.